I knew Tariq to be a genuinely friendly and helpful individual. I will always remember his beautiful smile. His death is a real shock to me and the rest of the Pakistani-American community in Silicon Valley. May his soul rest in peace. Amen! "Tariq Khanzada had just left the hospital after cuddling for hours with his newborn granddaughter, Minnah, when he saw the BMW crash in front of him and come to a stop on the right shoulder of Highway 237. It was about 2 a.m. Wednesday, with hardly a soul around on the dark Sunnyvale freeway. But with a stranger in distress, anybody who knew anything about Khanzada isn't surprised about what he did next: He climbed out of his Mercedes and walked across the highway, according to the California Highway Patrol. Khanzada didn't know the driver and most likely stopped to help, his family members speculate. In the seconds that followed, two other cars traveling in the fast lane happened upon the darkened accident, crashing into the disabled BMW in a chain reaction wreck that killed Khanzada, a 51-year-old computer engineer and an active Muslim community member who was known for always pitching in to help". I attended his funeral today, along with hundreds of other people at the Islamic Society of East Bay mosque in Fremont, CA. There was genuine outpouring of emotions by his friends and family, many of whom recalled Tariq's altruistic nature and lauded him as a genuine Muslim-American hero. I entirely agree that our friend Tariq Khanzada was a genuine Pakistani-American hero who risked and ultimately sacrificed his own life attempting to help others in need. He was indeed a good samaritan and a real "shaheed". But let's not ignore the advice of California Highway Patrol to stay in the car when faced with a similar situation. "After a recent string of accidents in which one accident -- followed by another -- has ended tragically on South Bay roadways, the Mercury News published a story last week in which the CHP offered advice on the safest thing for motorists or passers-by to do: stay in your car, keep your seat belt on, drive to the shoulder, call 911 and wait for police." At the funeral, molvi sahib narrated that Tariq had asked one of his hajj-bound friend to make 5 duas, one of which was that he die like a shaheed! And when he left this duniya, his heart was full of love and happiness for his granddaughter. Very sad to here it. Especially when it could have been avoided. But it is a written part of the highway code. Never get out of your vehicle to help accident victims, if your own vehicle was not involved. I thought it was a pretty heartless rule when i was giving my driving test in Europe. Now i understand why. The only time you should aid others on the freeway is when you are involved in the accident. Even then the first order of business should be to place the warning triangle atleast 150 m from the site of the accident to warn other motorists. Thank you Riaz for writing on him. He is a true “American Muslim Hero” and I am calling him an “American Muslim” because as much as I knew him this is what he would like to be called, we will call him a hero. As my friend Razi said “He died doing what he did the best, helping others” a tremendous loss indeed. A reminder to us all that life is fragile, cherish your loved ones friends, family and the society around you, correct things now, that otherwise you may not get an opportunity to correct. After a recent string of accidents in which one accident -- followed by another -- has ended tragically on South Bay roadways, the Mercury News published a story last week in which the CHP offered advice on the safest thing for motorists or passers-by to do: stay in your car, keep your seat belt on, drive to the shoulder, call 911 and wait for police." In case you have to step out of your car in a dark night, please make sure you have “Emergency Road Flares” to light up, ‘cause you are a target and a sitting duck at that time. Please buy these flares today and keep them in your car for emergency. Tariq Khanzada will be missed, by his wonderful family and friends like us, we hope you are at a better place Tariq. Inna Lillahai Wa InnaIllahai Rajaun He and his family is dedicated in helping others. In his funeral there were people of all faiths and a few of them went to graveyard as well to bid farewell to him. He was a nble soul indeed. I am terribly shocked to hear the sad news of our ace course mate..... May Allah rest his soul in peace and give courage to his dear ones to bear the irreparable loss. Where is he burried? Any contact number? Please let me know. Whoever reads this message, please recite Fateha for our loving course mate TAM. May Allah bless his soul. Amen. Shahid Hamid: "Oh my God!!! Where is he burried? Any contact number? Please let me know." Tariq is buried in the Muslim cemetery in Livermore, CA. I am not at liberty to disclose any contact info other than to say that his family lives in Fremont, CA. 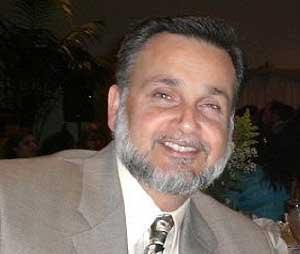 Pakistani-American mayor Omar Ahmad of San Carlos, CA died suddenly yesterday. It's really shocking news. I met Omar recently in San Jose when he gave a very humorous but inspirational talk at a Human Development Foundation (HDF) fundraiser just last month to encourage young Muslims and Pakistani-Americans to make a difference through public service in America. Here's an excerpt from Prof Adil Najam's Pakistaniat.com post on his sudden sad demise. I never met Omar Ahmed, but I remember first hearing of him when he famously responded to a question about whether his being a Muslim affected his position as Mayor of San Carlos City, California, that “there’s no Muslim way to fill in a pothole.” It was with great sadness that I learnt today that he had suddenly died of a heart attack at the young age of 46. Pakistani politician Zamarrud Khan intervened to distract a gunman who was challenging Pak authorities while holding his wife and two children hostage. This gave the police the opportunity to shoot and disable the gunman Sikandar and his wife. Some are calling Zamarrud Khan stupid while others are praising as a hero. The fact is that there's a an element of "stupidity" in every heroic act. That's why normal risk-averse people do not become heroes.